Daniela Tagtachian is the inaugural Mysun Foundation Fellow of the Environmental Justice Clinic at the University of Miami School of Law. The Environmental Justice Clinic provides advocacy assistance to communities discriminated against by public and private actors in the contexts of the built and natural environment. The clinic’s work lies at the intersection of civil rights, poverty law, public health, and environmental protection. Ms. Tagtachian has a background in poverty law and focuses on the built environment. In addition to supporting the Clinic’s work on the natural environment, Ms. Tagtachian is taking on community projects addressing the environmental and public health consequences of municipal practices that adversely and disproportionally affect the well-being of low-income communities of color. Her work includes a campaign to remedy the adverse effects of displacement and resegregation in low-income, predominantly African American communities. Ms. Tagtachian is a graduate of the University of Chicago (B.A. in Political Science with Honors) where she served as the Lead Researcher for the Rev. Jesse Jackson Sr. and a Teacher’s Assistant in inner-city schools in Chicago through the Neighborhood Schools Program. She is also a graduate from the University of Michigan Law School where she served as an Executive Editor of the Michigan Journal of Race & Law, President of the Latino Law Students Association, and a student attorney in the Human Trafficking Clinic and the Pediatric Advocacy Clinic. She also interned for the Office of the United Nations High Commissioner for Human Rights’ Women’s Rights and Gender Section in Geneva. 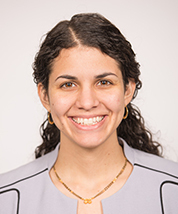 Upon graduating from Michigan Law, Ms. Tagtachian served as a Researcher for the Policy Working Group on Global Development and Humanitarian Response and received a fellowship to work with the Slave Labor and Human Trafficking Clinic at the Federal University of Minas Gerais in Brazil. She then worked for Hogan Lovells US LLP as a Litigation and International Arbitration Associate. In addition to chairing the Miami Office’s Women’s Initiative Mentoring and Citizenship Subcommittee, her pro bono matters included serving as the attorney ad litem for a child in foster care and evaluating a prisoner of conscience case from Turkey.